Fife Flyers will hit home ice for the very last time this season on Sunday to take on Belfast Giants in a crucial play-off tie. The clubs were paired in the draw for the last eight, with the first leg in Belfast on Saturday night. Flyers have now confirmed the return match will be in Kirkcaldy on Sunday night with a 6.30 p.m. face-off – and it could bring one of the biggest crowds of the season to the rink. Tickets are now on sale from the box office and the club’s website. The winners from the head to head will go on to the play-off finals weekend at Nottingham on April 8-9. It’s a fascinating match-up, and Fife will need to play the tightest road game in Belfast if they are to then secure qualification on home ice. Results between the two this season have gone with the home team. Flyers racked up three home wins over Giants, the closest being a 3-2 OT victory in December. On the road, they have drawn a blank in Belfast, losing 4-2, 4-0 and 7-2. Travel wise it’s arguably the toughest draw Fife could have had. The standard arrangement is a long bus trip to Stranraer and then a ferry across the Irish Sea, with the return straight after the game. The most recent journey saw the team endure a rough return sailing which left more than a few players struggling to cope, and then a very late return to the Kingdom, to prepare for a game on home ice that night. Giants, on the other hand, only have to make the one journey to Kirkcaldy. The other option is flying the team across to give them the chance to arrive on the island fresh and ready to play the biggest road game of the season. For Sunday’s return, Flyers’ season ticket holders will have their seats held as a priority until 6.00 p.m. on Thursday. >> The end of the regular season tonight saw Manchester Storm clinch their first ever play-off slot, leaving Coventry Blaze and Edinburgh Capitals as the teams that missed out. 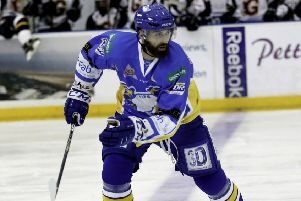 Storm, in only their second EIHL season, take on Cardiff Devils with the first leg in Wales. There’s a huge quarter-final showdown between Sheffield Steelers and Nottingham Panthers – meaning one of them won’t make the finals weekend – and there WILL be a Scottish club at the finals as Braehead Clan and Dundee Stars go head to head.